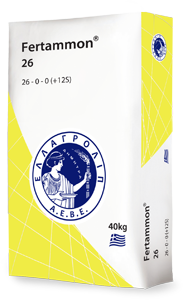 Fertammon 26 is a high quality nitrogen fertilizer which has been designed for the efficient nutrition of crops with Nitrogen and Sulphur. It combines a specialized ratio (3:1) of the Ammoniac (NH4) and Nitric (NO3) forms of nitrogen with high Sulphur content in its grain. Nitric Nitrogen is promptly absorbed by the roots and covers the short-term needs of development, while ammoniac nitrogen is retained in the ground and extends the supply to the crop for a longer period of time. The high Sulphur content (29SO3) contributes to the absorption of Ammoniac Nitrogen, has a direct impact on the growth of the root system, and at the same time participates in the synthesis of proteins and aromatic compounds which improve the qualitative and organoleptic characteristics of the production. The excellent granulometry and specially designed composition of Fertammon 26 perfectly meets the needs of field crops in all types of soils.